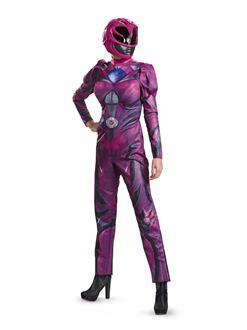 Go disguised from head to toe this Halloween in our Power Rangers Deluxe Pink Ranger Adult Costume! You may not be the most powerful Power Ranger, like the Red Ranger, but you’ll make hearts flutter as one of the valued Pink Rangers! Included in our Pink Ranger outfit is a detailed pink jumpsuit with 3D torso, attached shoulder pieces to give you larger-than-life muscle and a full Pink Ranger helmet. You can’t go more disguised than in this complete outfit! Visit our online store for more Power Rangers costumes and accessories for kids, men and women—especially if there are more Power Rangers action heroes in your family!